The Princess and The Pump: A Type 1 Diabetes Blog: Too Sweet Boutique and Skidaddle Bags: The Ultimate Giveaway! Too Sweet Boutique and Skidaddle Bags: The Ultimate Giveaway! Today I have the privilege of sharing with you an incredible giveaway! Two of my favorite diabetes retailers have joined forces to create some super cute, super functional coordinating products! They are proving that while we might have to live with diabetes, we can certainly look good doing it! The first awesome prize is from Too Sweet Boutique! 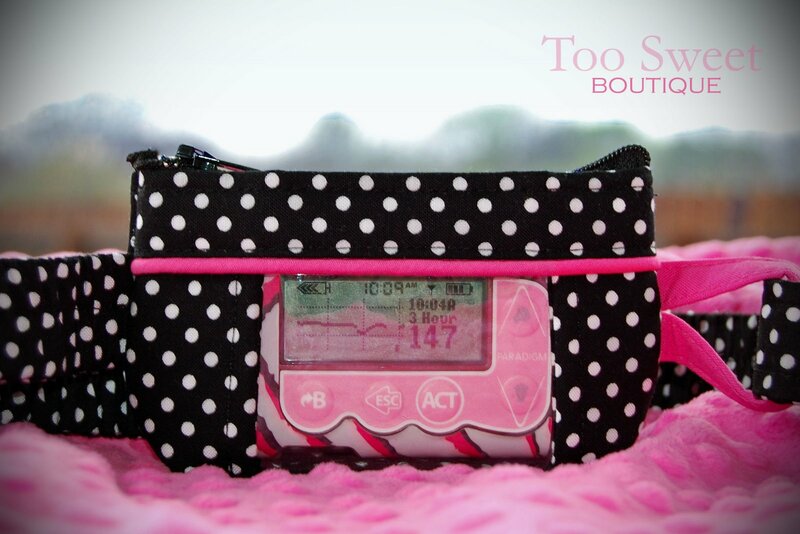 Too Sweet Boutique offers fun, functional and fashionable pouches for insulin pumps and diabetes supplies. If you've been reading my blog very long, you know that Too Sweet pouches are the ONLY pouches that Sweets will wear. She loves them so much that I often have to sneak them off of her in order to wash them! They are discreet and easily hid under clothing. However, they are also so darling that you might just want to show them off! Amy, the owner and designer of Too Sweet Boutique, started making pouches after her daughter was diagnosed with Type 1 Diabetes at the age of 11 months. Her little sweetie started pumping at 13 months old and Amy decided that to get the best, cutest, most functional pump she was going to have to make it herself! Amy makes each pump pouch by hand with the very best materials and lots of love! 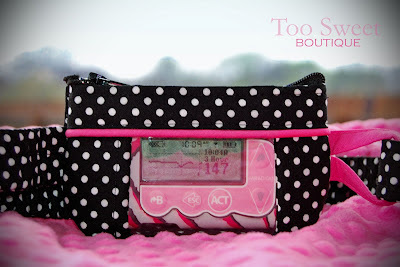 Too Sweet Boutique is giving away a Black Dot Pump Pouch! How darling is this?!? This design is perfect for a stylish gal of any age! The winner can choose the Simply Practical or the Perfectly Clear pump pouch. (Click HERE to see the different options!) Never fear if you don't wear a traditional pump or even if you are not a pumper! If you use the Omnipod, you can get the pouch sized to fit the PDM. You can also get the pouch sized to fit the Dexcom receiver (This is what we do since we are podders! We love it!). Or you can use the pouch as a great way to carry a cell phone, clicker, meter, and some tabs! The second incredible item is from Skiddadle Bags! Skidaddle Bags are changing the look of diabetes - one bag at a time! Skidaddle Bags are made from the finest materials to ensure easy care and durability. We all know our diabetes bags take a licking - and we need something that can hold up to everyday use. But we also want something that is cute! That is exactly why Maria, owner of Skidaddle Bags, started designing bags! Maria has a super sweet little girl of her own who was diagnosed with diabetes at the age of 4. One day her daughter told her that she wished she could have a "happy" bag for all of her diabetes supplies. And with that - an idea was born! Skidaddle makes bags that are functional and durable - but also CUTE and nothing to be embarrassed about carrying around. 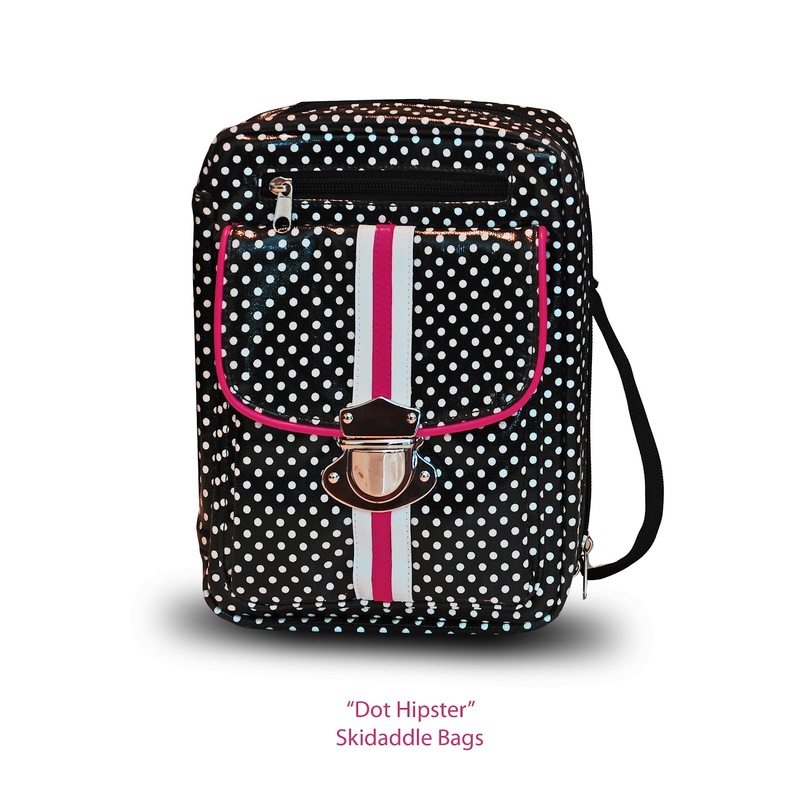 Skidaddle Bags is giving away a Black Dot Hipster! Is that not one of the most stylish bags you've ever seen?!? 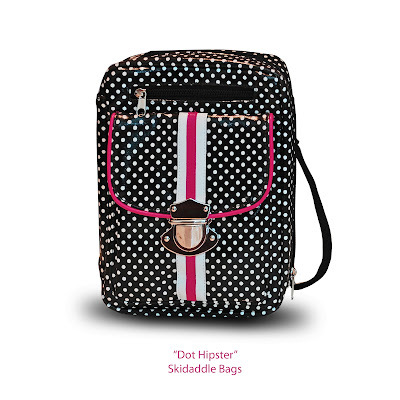 Chic and sweet, the hipster is built to carry your most important diabetes medical supplies. There are three outer pockets ideal for your cell phone, keys and small items. Inside are three netted pockets, four elastics, one hidden pocket and a center pocket ideal for your Glucagon. The inside is insulated and the canvas fabric has been laminated with a matte PVC to keep the bag looking like new. Just wipe and go. The dimensions are 7" x 9.5" x 2". To see a look at the inside of this beautiful bag, click HERE. Can you just imagine how awesome you or your sweet one would look with these coordinating diabetes supplies?!? I know you want to win these prizes.... So here's what you need to do. Pay attention. The rules have changed! 1. You must do all of these things to get ONE entry. Once you have liked all three pages, leave a comment on this blog saying that you have done so. Once you have done one of these things, leave a comment on this blog saying that you have done so. 3. You can earn UNLIMITED entries for each new fan you send to both pages. So ask your friends to head over to Too Sweet Boutique and Skidaddle Bags on Facebook and leave a comment on each page saying that they are a new fan sent by "Suzy Q". Don't forget to leave your first name on all entries. Entries with no name will not be counted. Once the giveaway has ended, we will count and number the entries. The winner will then be selected by random draw at Random.org. You have until Monday, March 26, 2012 at 12:00 am EST to enter. The winner will be posted on this blog on Wednesday, March 27, 2012. Paulla Cornett has liked all 3 pages and also put it on my FB page about the give away!!! Thanks!!!!! Liked all 3 :) Such wonderful items! Hi! I've liked all three of the pages and I've shared the link on FB! Like all 3 pages ( wish the button said Love instead of Like!!!). Posting on my wall too, and crossing my fingers!!! I've liked all three pages! Love these products! I've "liked" all three pages!!! I love these products! oops entered the same comment twice! Hi, Hallie, I've liked Too Sweet Boutique and previously like Skiddadle and your page. Linked to the giveaway on Facebook! Just a question: what if I don't have a facebook, twitter or anything like that? Love this!! And live all the pages... Thank up! I shared the giveaway on facebook!!! Liked all 3 pages! Thank you!! I have liked all three pages. And have shared the link on FB. I have all 3 liked! Yeah! Like all three of you!!! Em needs a new pouch!!! Bad!!! We need a win here!! I like all three on FB. Like all 3 of you! We NEED to win this one!! I forgot my name on the others! I liked all three pages - I'm a new fan sent by Nora Mulligan. I am hoping Nora Mulligan's daughter, Sarah, wins the pump. Good luck, Sarah. And best wishes to ALL the children who have to endure this. I hope they find a cure for all of you. Stay strong! loved all three pages. even if I don't win, I might have to get a bag anyways...super cute! liked/loved all three pages! super cute bags!!! I would LOVE to win this! Brianna loves both products and I Love reading your blog! Thanks for another great contest!! I tweeted about this giveaway!!! Ironically, Nevaeh starts the pump on March 27th the day the winner is announced!!! Liked all three pages. My DD loves the look of these bags!! She is all about the poke-dots. Thanks! We love our Too Sweet Boutique waist pouch and would love one with a window now that we are CGMing. DID IT! OMG are those absolutely beautiful! My 6 year old was so excited! She asked if we could buy it if we didn't win it! Cool! LOVE these pouches/bags but since my boy wouldn't be caught dead with them, I know the perfect sweet girl that would LOVE to have them if I win!! Liked all three pages and shared on my Facebook page. You guys are awesome! Love your products! I liked all three pages and shared on my facebook. So excited to participate in something fun related to my daughter's diabetes. Even if we don't win, we enjoy having something to look forward too. Thanks for doing this!! Cheryl speights and Abby. Hello! I have liked all three pages, and added that I was sent by Cheryl Speights. I have also posted about the contest and this blog on my own blog (http://jaxxtaposition.blogspot.com/) and on my Facebook! Like all three on Facebook! I liked all three on Facebook. My fingers and toes are crossed that we win!!! I liked all three on Facebook. Fingers and toes crossed that I win!! Liked all three on facebook, and made a personal post on my wall. My daughter Alexis just received her pump 3 days ago on March 11th. We're excited! I've liked on all three Facebook pages. I was sent by Kellie Douglas Kaesche. Please enter us in the drawing. Thank you. shared all three sites on facebook. I have liked all 3 pages, and I am a new fan sent by Bethany Ranes.love what you are doing! Holly: Shared on FB and liked all Pages! I like all 3 but forgot to leave an entry, so here it is. Thanks for having the give away! Liked and love all three!!!! Misty L.: I liked all 3 and Shared on my FB page as well. Sarah Davis likes all three on FB. Love your creative, functional supplies. In fact, I just ordered another too sweet pouch for my four year old little pumper! Hello! I have liked all 3 on Facebook and shared the link on my facebook! I liked the two company pages today... had already "liked" your FB page! I LOVE black & white with bright pink in anything, and would love to win these for my daughter! I like all on Facebook! My 5 year old would love these. Liked all three pages....also mentioned it on my FB page. Fingers cross we win (: 6months post dx...this would bring a BIG smile to my Sweet Livy Loo's face! Liked all 3 pgs...and shared on my FB page. Hoping we win. 6 months post dx...this would bring a BIG smile to my Sweet Livy Loo's face. i liked all three pages and posted on fb for everyone to see how awesome our doc family is. Thanks for always doing positive things for the doc. We would love to have these since my D daughter Madi just started on the pump last Sat. and we use a cgm as well. i liked all 3... i love ALL of your creations!! Jessica Jimenez 10 years of being type 1 on May 1 2012!!!! I liked all 3 and I facebooked about the giveaway!!! I liked all 3 on facebook. I love the bags. We actually start pumping next mon.